For us long-term travelers, eating out every night is expensive and generally unhealthy. There are some exceptions, such as in certain regions of Asia, but they’re rarer than you’d think. 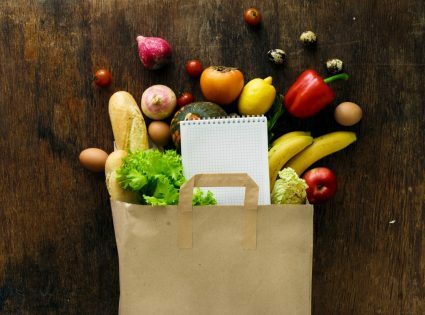 So we need to find a balance between cost, convenience, taste, and healthiness. It’s difficult enough at home, let alone on the road where no two days are the same. That’s why we’ve put together a list of foods that are cheap, healthy, convenient and taste great (if you prepare them right). So hopefully this will be the only grocery list you’ll need for your travels. Don’t get me wrong, we love to hit the streets to try the local cuisine as you do. It gives us a chance to interact with local people, try new foods, and revel in the atmosphere of a foreign place. But this list is about those times in between when you need to look after yourself for the next big adventure. What you need is a mix of foods that are high in fiber and high in essential vitamins and minerals, but low in saturated fats and low in simple carbs. 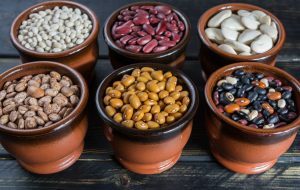 Kidney beans, lentils, chickpeas, lupins, and most legume-type beans are high in protein, high in fiber, very low in fat, very low in simple carbs, and taste great when prepared right. Try a tomato-based salsa and add to any meal to provide healthy bulk. For long-term travelers, there’s no other food that packs so much bang for its buck. Check out these tasty bean recipes. Great for breakfast, but also a substitute for lunch and dinner when you’re on the run. 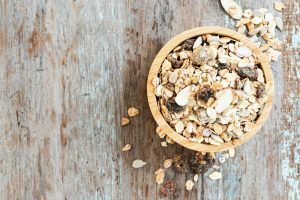 Unlike beans though, muesli is very high in energy, which is why it’s best for breakfast. A good raw muesli will have lots of whole grains to provide slow-release energy for endurance pursuits. But stay clear of the refined grains and added sugar. Also, try to avoid toasted muesli; they use a lot of oil (fat) to achieve that toasty taste. And while you’re being health-conscious, consider soy and/or skim milk. Nuts are very high in fat, but in moderation, they add taste to otherwise bland meals and they provide essential fatty acids (Linoleic and Linolenic Acid) that your body needs, but can’t produce itself. See the chart below for further nutritional info. Walnuts, almonds, and pecans are your best bet. But remember… moderation is key. 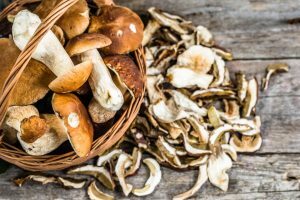 Often called meat for vegetarians, mushrooms are very low in calories, fat, and salt, but high in many vitamins and minerals that ward off disease. This means they’re perfect for filling your stomach without providing too much energy. Like beans, add mushrooms to any meal to provide healthy bulk. If you get the chance, pick your own wild mushrooms for dinner. While staying in Australia’s Blue Mountains, we picked the most creamy and delicious mushrooms we’ve ever tasted. Make sure you’re with someone knowledgeable since many mushrooms are poisonous. Drinks are generally very high in sugar. The average soft drink has 8-10 teaspoons of sugar. Imagine making a cup of tea and adding 8 teaspoons of sugar… crazy right? Well, that’s most drinks for you, including fruit juices. Even those ‘healthy’ iced teas and flavored waters contain a shedload of sugar. Why is that bad? For starters, it’s all that nasty refined sweetener, not the good stuff from raw fruits. And refined sugar is bad in every way, but most of all, it causes chemical imbalances that trigger cravings even when your stomach is physically full. The healthy, cheap, smart alternative is to wean yourself off drinks altogether. Just drink water, tea, and good wine. You can please your taste buds with food instead. You’ll save a lot of money and save yourself from thousands of empty calories on a daily basis. Add some lemon to the water for taste and a few nutritional benefits. Why ‘light’ vegetables? Because most dense vegetables, such as potatoes, are energy-laden without providing unique vitamins and minerals. You can generally get your recommended daily intake from alternatives that contain much less energy. Most nutritional charts even exclude potatoes from the vegetable category. So what are we left with? Beans, peas, carrots, eggplant, asparagus, spinach… basically everything else. But don’t go overboard with carrots (they taste good for a reason) and avocados (lots of fat). Otherwise, a good mix of vegetables can be very high in fiber, high in complex carbs, very low in fat, and high in a variety of essential vitamins and minerals. I’ve left fruit towards the end because even though it contains unrefined sugars, it still contains a lot of sugar, so you need to take care. The sugars are simple carbohydrates, which are great for supplying your body with energy quickly, but unless you’re doing something strenuous, that energy will store as fat, spike your insulin and increase your appetite. However, fruits contain many vitamins and minerals essential to bodily functions. So it’s important to eat a range of fruits in moderation. Try to only eat whole fruits that have less of an insulin impact (low GI rating), such as apples. And although it’s best to eat fruits earlier in the day (when you’re active), they’re much better than most deserts, so also consider satisfying your sweet tooth after dinner with a small mix of low-GI fruits. When was the last time a meat-eater didn’t get enough meat? I know, it can happen, but hey, it’s probably the last of your worries as a long-term traveler. Meat contains a lot of protein and provides a good source of vitamin B12 (generally only available from animal products), but it is also high in saturated fats and doesn’t contain any fiber. So this is my thinking… Firstly, you’re going to get enough meat when you eat out. Secondly, vegetables, dairy products, and nuts provide 99.99% of an intrepid traveler’s nutritional requirements in a much safer form (less saturated fat, more fiber, etc). And lastly, absence makes the heart grow fonder and stronger. Spend 3 months eating beans and mushrooms, and you’ll find that a thick Kobe or Argentine steak will taste like heaven. One exception is fish. You can add good quality canned salmon to any bean or vegetable dish and get a good amount of highly polyunsaturated fats (Omega 3s) and a good dose of protein.